The target craters for the impact of NASA's LCROSS mission, which is due to slam into the moon Oct. 9. The first choice target is the Cabeus crater, pictured. This story was updated at 6:52 p.m. EDT. The moon isdue for a double whammy from two NASA probes Friday, with scientists assuringsome skeptics that smacking the lunar surface with spacecraft is really okay. 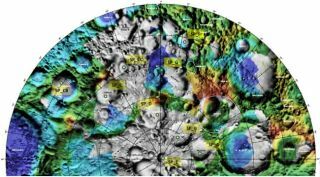 NASA?sLCROSS mission will slama spacecraft and an empty rocket stage into the moon?s south pole Fridaymorning at 7:31 a.m. EDT (1131 GMT) in a search for water ice buried in theperpetual shadows of lunar craters. Scientistsare eagerly awaiting the LCROSS crashes and hope they?ll provide a definitiveanswer on whether lunar water ice could be used to support future astronauts onthe moon. But at least one person ? novelist and screenwriter Amy Ephron ? hasspoken out against the $79 million mission on her Huffington Post blog andlaunched a Twitter campaign ("helpsavethemoon") to save the moon from future onslaught. ?I'm not abig fan of explosions, anyway. In Iraq or Afghanistan or the South Pole of theMoon. But who does have a territorial prerogative there?? Ephron wrote. ?Whohas jurisdiction? Who has the right to say that it's okay to blow up a crateron the moon?? Apparently, Mother Nature does. The moon is covered in craters, with new oneslike those to be created by the LCROSS probes popping up all the time by meteoritesthat pummelthe lunar surface. ?The imageof this impact, what we?re doing with the moon, is something that occursnaturally four times a month on the moon, whether we?re there or not,? LCROSSprincipal investigator Tony Colaprete told reporters Thursday. It?s thatlure of ice that drew the interest of LCROSS scientists. Such a resource couldbe a boon for NASA?s plan to return astronauts to the moon since it could beused to support a lunar base. SomeSPACE.com readers have expressed concerns over the possibility of the mooncrash destroying evidence of the very water ice LCROSS is hoping to uncover. But missionscientists say that shouldn?t happen. The amount of hydrogen-bearing materialis vast within the Cabeus crater, which is 60 miles (98 km) wide and 2.4 miles(4 km) deep. The impressions left by LCROSS and its Centaur rocket are expectedto be about 66 feet (20 meters) wide and 13 feet (4 meters) deep. The plumeshould rise up about 6.2 miles (10 km) and be illuminated by the sun,researchers said. That?s notto say the LCROSS probes won?t have any effect on the moon. The laws ofphysics, Colaprete said, mean there will be a miniscule perturbation. ?The impacthas about 1 million times less influence on the moon than a passenger?s eyelashfalling to the floor of a 747 [jet] during flight,? Colaprete said. That meansthe impacts will be little more than a pinprick, if even that, to the moon. Butthey will still be substantial blows on a human scale. When LCROSSand its Centaur stage hit, they are expected to kick up about 350 tons of moondirt. The Centaur stage, which weighs more than 2 tons ? about as much as asport utility vehicle ? will be first, followed by the smaller LCROSS shepherdcraft four minutes later. Theshepherd craft will beam images and data of the impact plume to NASA?s missionoperations center at the Ames Research Center in Moffett Field, Calif. A hostof Earth-based observatories and amateur astronomers, as well as satellites andspace-based assets like the Hubble Space Telescope, Sweden?s Odin satellite andNASA?s powerful Lunar Reconnaissance Orbiter circling the moon, will also scanthe resulting plume for evidence of water. Scientistsnow know for sure that there are some traces of water on the moon. Theyannounced as much last month citing data from recent spacecraft that revealed thesignal for water across wide swaths of the lunar surface. Rather thansteal the LCROSS team?s thunder, the finding only bolstered the team?s spiritsand excitement, Colaprete said. ?The onething we?ve learned about the moon is how much we really don?t know about themoon,? he added. ?And we are still learning and LCROSS is going to provide usadditional data to further understand it.? SPACE.comis providing full coverage of the LCROSS moon crash. Clickhere for a look at the mission and return to SPACE.com at 6:30 a.m. ET(1030 GMT) for live crash coverage.